Home > Destiny Media Technologies, Inc.
Found 5 file extension associations related to Play MPE Player and 1 file format developed specifically for use with Play MPE Player. Developer: Destiny Media Technologies, Inc. 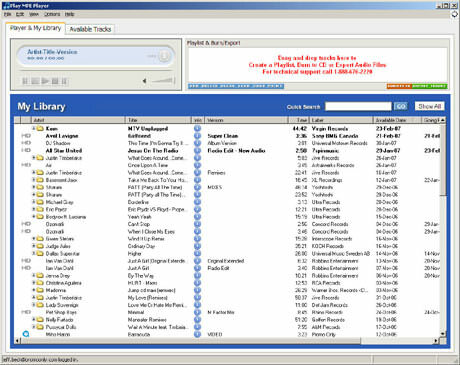 Play MPE Player is a software application which has a web-browser interface allowing industry professionals to gain access to authorized MPE music and video files. This simple and feature-enhanced software provides the ability to quickly stream, download, export, and burn both audio and video tracks. Tracks can be exported as .WAV files for on-air broadcast, and can be directly exported as to one's iPod and other personal media players. Videos can be exported as Quicktime or Windows Media Video files. This software is a complete media player, allowing playback and burning of all audio formats including WAV, AAC, MP2 and MP3 files. If you need more information please contact the developers of Play MPE Player (Destiny Media Technologies, Inc.), or check out their product website.